It’s “joked” about amongst my husband’s coworkers (our pastors and church staff) that we’re all just one light bulb away from being Amish. I say “joked” because it’s not far off from the truth. We don’t have social media and, honestly, if I had my way, you’d all be reading this via handwritten newsletter. Unfortunately for me, the international postage would be brutal… Hence the advent of the internet. Anyway, I was thinking about all the things lost with the advent of the industrial revolution and technology as it pertains to life on the homestead. Hear me out– I know there are so many ways technology helps us out like heat lamps for chick brooding, incubators, tractors, etc. I’m not knocking their usefulness. I’m simply saying that certain things were lost along the way. I first really became aware of this as I observed my orchids and aloe vera plants in the kitchen window sill. I noticed they started looking weak and spindly. They lost their vibrant green and became, for lack of a better word, slouchy looking. For the life of me I couldn’t figure out what was up! They’d always done really well in that location since we moved in almost 3 years ago. So what was up? I wracked my brain and finally decided it was just time to fertilize… And there I had it. As some may know, I’m anti-chemical fertilizer and I prefer to use what I have on hand where possible. So, my go-to is coffee grounds… Coffee grounds!!! Then it dawned on me– a few weeks prior, my husband had been given a nice electric Bunn coffee maker. For those who aren’t coffee nerds, the plus of a Bunn is that it constantly keeps the water hot so coffee is made virtually instantly, and there is a pot warmer that… Warms the pot… Obviously. The horrible realization came when I finally understood that instead of making the coffee in my French press (which still makes the best tasting coffee, IMO) I was using the Bunn out of convenience and therefore, the coffee grounds and biodegradable filter were going straight to the compost instead of being used to water my house plants! I was heartbroken! 1, because I had succumbed to the instant gratification mindset that plagues my millennial generation. And 2, because it had caused my plants to suffer. So, bearing that in mind, I make sure the plants get coffee grounds whether I use the french press or the Bunn. But it really did make me consider the effect of technology and electricity on our agricultural pursuits. Back in the day, everyone had a fireplace or wood burning stove. They heated their homes with wood, and put the ash in their gardens, or used it to make lye soap. This was just the natural flow of daily life! The soil got nutrients and minerals from the ash, people had soap, and there was no waste. Now we have gas fireplaces, or worse still- no fireplace or wood burning stoves. We heat with electricity which is outrageously expensive, and our gardens don’t have the benefit of the wood ash! So then we go out of our way to purchase biochar or the biocharlie (which again, I feel is way over priced). When, if we were more conscious of wood as a renewable resource and ash natural soil amendment, we may all switch back to wood heat. Anyway, these are the types of things that bounce around in my mind. And now, I’m really looking forward to getting our fireplaces up and running. 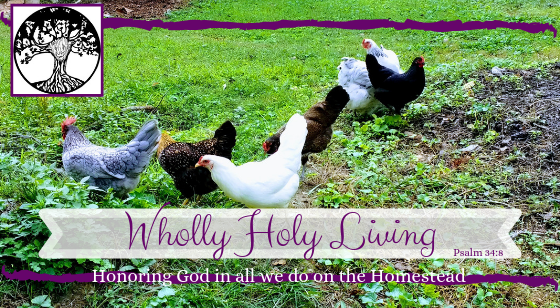 The more we homestead the more I see all the millions of connections between the home, gardens, and livestock that make for a very balanced little ecosystem. Livestock eats kitchen scraps, makes manure for compost pile, makes milk for the family (or eggs or meat), excess milk can potentially feed other livestock, compost goes into garden, garden makes veggies for the family and the scraps and stems etc go back to the livestock which use it to make more manure and more food for the family…etc…etc.. And that is just the very basic and simple version! It is so amazing and works so beautifully. It really is beautiful how it all operates in conjunction. And it’s deeply satisfying to play my part in the cycle.